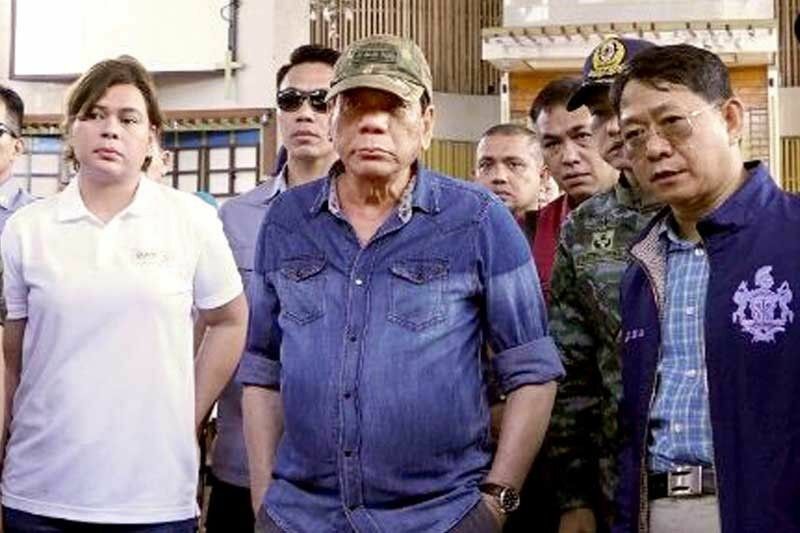 DAVAO CITY – An enraged President Duterte spewed out expletives as he inspected the bombed out Jolo cathedral and condoled with the victims’ relatives yesterday in Sulu. “Anger was written all over the President’s face. Talagang galit (Really angry). And he took a long time talking with the survivors as well as the families of those who died in the attacks,” a source told The STAR. The source said Duterte blamed the terrorist Islamic State and let out a hail of “p.....g ina” as he declared war on IS. “Of course he was so angry, for one. For another, he is so disappointed that despite the movement to tread the path toward peace and development, there are still certain forces in that region who sowed terror and killed and murdered people,” presidential spokesman Salvador Panelo said. Panelo declined to comment on claims the bombings had something to do with the recent plebiscite on the Bangsamoro Organic Law, which was rejected by Sulu residents on Jan. 21. “He will wait for the investigation. Of course, one Islamic State is claiming responsibility. I read it in one of the briefers, that one terrorist group is claiming responsibility for that. But we have to wait for the investigation,” the spokesman said. Panelo also said it would be unfair to accuse Moro National Liberation Front founder Nur Misuari of plotting the bombing. “We cannot enter into the realm of speculation. It could be unfair and not good to be speculating. I know that Nur Misuari wants federalism better than BOL but he didn’t oppose it actively. In fact, he was non-committal with respect to the plebiscite,” he added. Panelo claimed the bombings in Jolo are “isolated” incidents and maintained that the martial law being implemented in Mindanao had been effective in curbing threats. When reminded that an explosion rocked Cotabato City last Dec. 31, Panelo said the bombings were “little” compared to the “chaos” that would have ensued in Mindanao without military rule. At least two people died and 35 others were hurt in the Cotabato explosion.